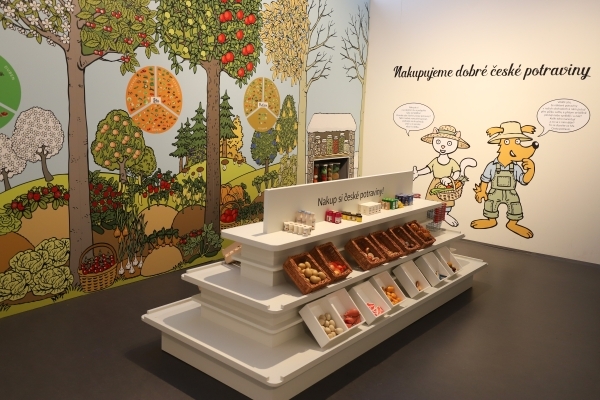 The Gastronomy exhibition at the National Museum of Agriculture in Prague combines a children’s gastronomical playroom and a gastronomy studio, while also offering a look at food and its preparation from many perspectives. The gastronomical playroom not only guides children through the history of food and eating, but also offers a glimpse into the kitchens of our grandmothers, great-grandmothers and their predecessors. Visitors can test their senses and try to recognise spices by smell, sounds related to cooking by hearing, and individual foodstuffs by touch. In the shop, children learn to recognise Czech food – the correct choice of food is then shown in a receipt which they can print off themselves at the children’s checkout. In front of the glass gastronomy studio, where food is cooked primarily by professionals and where cooking courses are held, children can try their hand, for example, at preparing sponge cake and muffins, or virtual cooking of a number of recipes on interactive screens. Real dishes also have to be eaten – and so the playroom also teaches children the proper table setting for many varied occasions. The gastronomy studio is professionally equipped with a modern kitchen separated from the playroom by a glass wall. In the studio, representatives of the Association of Chefs and Confectioners of the Czech Republic train for international competitions, where they represent our country; the Marie Sandtnerová Culinary Institute organises cooking courses under the guidance of top chefs and other events here. You can also watch the action inside the studio from the outside on screens which show pictures from cameras located above the studio’s worktops.